Terrace Cottage - a summer or winter romantic getaway, family retreat or skiing holiday base. 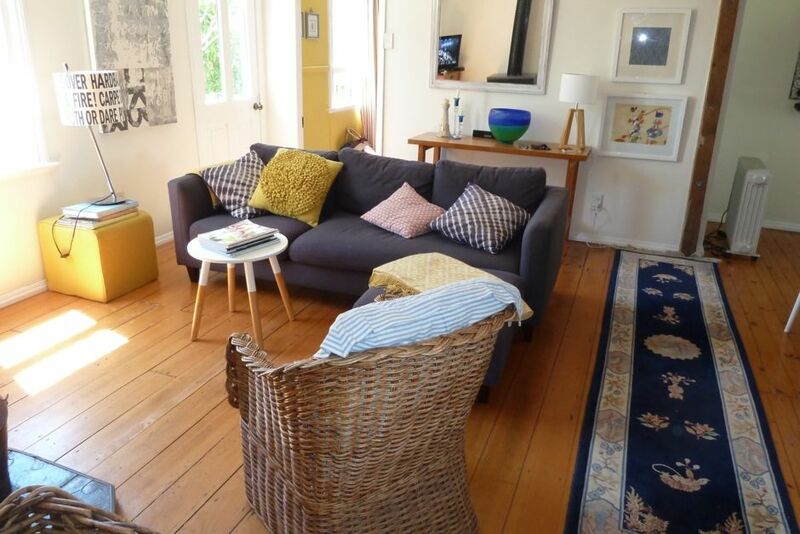 Terrace Cottage is a beautifully restored cottage in historic Whitecliffs Valley. This 100 year old former potter's cottage has been updated, with modern amenities and beautiful furnishings and linens. The cottage has a well equipped kitchen, you even have your own coffee machine! A log fire heats the cottage and plenty of firewood is provided. The beautiful gardens give plenty of shelter and privacy with facilities for outdoor dining and relaxation. Terrace Cottage is nestled among rolling hills and farmland, just minutes walk from the Selwyn River's numerous swimming holes and in the midst of excellent biking, walking and golfing opportunities. Jet boating, fishing and horse trekking are all available on your doorstep. Cafes and restaurants are just ten minutes away in Darfield or travel a little further afield to Terrace Downs, Methven, Springfield or Oxford townships. Terrace Cottage is the ideal romantic getaway or family retreat. Our Cottage also offers an excellent base for skiers as Whitecliffs is less than an hour from Mt Hutt and Porters Heights skifields. All this is just 45 minutes from Chch airport. The perfect place for a quiet weekend away, or a longer stay to unwind and enjoy all that the area has to offer. What are you waiting for! Please note tariffs under "Special Conditions"
Late cancellation of booking may result in loss of deposit if cottage cannot be re booked. Rate is for a single person or a couple . Extra guests $15 per person. The cottage was bought as a family getaway over 15 years ago. It has been renovated by us to provide updated amenities but still retain character of a 100 year old cottage, one of the oldest cottages in Whitecliffs. Our grandchildren never tire of exploring the area and my husband and I take every opportunity to enjoy the peace and serenity of the cottage. The cottage was perfect for our two night stay as it was only 45 mins to the airport which was the main reason for choosing. It exceeded all expectation. Spotlessly clean, gorgeous decor and the FINEST linen and toiletries. We would definitely choose to stay here again and possibly for longer. Everything the description promised it would be. We stayed here because it was close to Hot Air Ballooning in Hororata. Thank you Rosemary, we once again had a wonderful time. Your cottage is so homely and clean. Lovely crisp sheets, comfy beds, toasty fire. All in the most beautiful location. Thank you..we will be back soon! Thanks for your comments Holly, loved having you and your family, most welcome back. This is a charming, vintage property. We enjoyed discovering all its quirks and quaintness. Darfield was our go to town for groceries and gasoline. I felt the front garden needed a bit of TLC. I was tempted to do some sprucing up of the old beautiful bones. It was my go to spot with my morning coffee. It was filled with bird song. Lots of sweet china to choose from.l Loved the candles. Linens lovely! Needs some upgrading of cleaning equipment to make cleaning easier. Thanks so much for your feedback Gwen. Maybe you didn't notice but plenty of cleaning products under the kitchen sink. No vacuum cleaner though, with the timber floors throughout the cottage I find the carpet sweeper is fine for the rigs. Sorry about that. Yes with all the rain and hot weather the garden has grown a lot over the past month. Still I favour a rambling country garden, think it quite suits a 100 year old cottage..
Beautiful cute and cosy cottage which has been beautifully furnished. Rosemary clearly has an eye for design and has done a great job in creating a lovely space. Everything you need is provided and a lot of care has been put into the furnishings/soaps etc. If you are staying in winter be prepared for a sub zero temperature visit to the bathroom though as the windows don't completely close. If that doesn't bother you and you are after a quiet, rural getaway this is perfect. Lovely rural outlook in small village. Ideal as a gateway to ski fields, relaxing getaway or summer holiday destination with Selwyn river just a short walk away.